The term “kingdom of God” is absent from the Tanakh. However, the God of Israel is identified as King: (1 Samuel 12:12; Psalm 24:10; Isa 33:22; Zeph 3:15; Zech 14:16-17), as ruler over Israel (Exod 15:18; Num 23; 21; Deut 33:5; Isa 43:15), and ruler over the entire creation (2 Kings 19:15; Isa 6:5; Jer 46:18; Psalm 10; 47:2; 93; 96:10; 145:11,13). The God of Israel also possesses a royal throne (Psalm.9:4; 45:6; 47:8; Isa 6:1; 66:1; Ezek 1:26); His reign is ongoing (Psalm10:16; 146:10; Isa 24:23), and rule and kingship belong to Him (Psalm 22:28). Bruce Waltke notes that the phrase “kingdom of the Lord” occurs in various forms and in only fifteen isolated texts (Ps.22, 103, 145; once in Obadiah; four times in Chronicles; and seven times in Daniel). In the face of human rebellion and sin, God continued to assert His kingship and He continued to use Israel as a vehicle for the kingdom. We see in the Tanakh that in an eschatological sense, God’s sovereignty is not universally accepted, but it will happen in the future (Zech 14 1-9; Dan 7:13-14; 2 Sam 7:11-12; 16-17; Matt 19:28). The kingdom theme in the New Testament is part of the great cosmic battle and a reversal against sin and Satan. It is also the kingdom over which Jesus is currently ruling (1 Cor. 15:25; Rev 1:5-6) and is also tied to the ultimate realization of the kingdom in 1 Corinthians 15:26-28, where Paul describes the ultimate giving over of this same kingdom to the Father at the end. The New Testament authors identify Jesus in God’s presence and at His right hand (Acts 2:24-33; 5:31; 7:55-56; Eph.1:20-21; Col. 3:1; Heb. 1:3; 8:1; 10:12; 12:2; 2 Peter 3:22). By participating in God’s rule, Jesus is able to place all things in subjection under His feet. This theme, seen in the following New Testament passage exhibits that in early Jewish monotheism Jesus came to be recognized as ruling the cosmos from heaven: “Far above all rule and authority and power and dominion, and every name that is named, not only in this age but also in the one to come. And He put all things in subjection under His feet” (Eph. 1:21-22). See Scot McKnight. 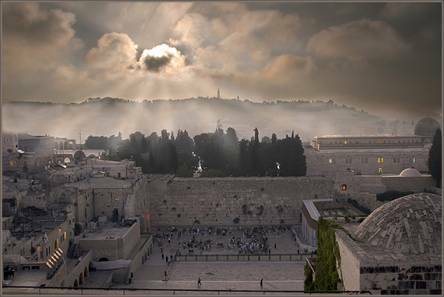 A New Vision For Israel: The Teachings of Jesus in National Context (Grand Rapids; Eerdmans, 1999), 70-155.